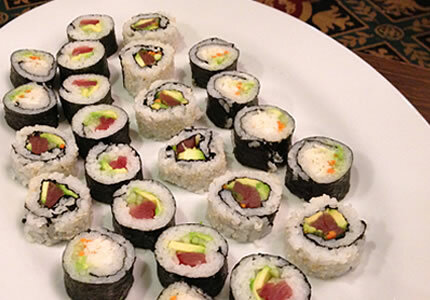 Making sushi at home might be easier than you think! We do it all the time. Jenny at savourthesensesblog.com shares her recipe for sushi rice and a spicy tuna roll. Thanks, Jenny! Once the rice is cooked, gently fold in the remaining ingredients and season to taste. Be careful not to overwork the rice or it will fall apart. Combine all ingredients in a bowl, mix well to combine. Toss sashimi fish to make filling for Norimaki rolls.